DALLAS, TX (June 25, 2014) This October, the Council for Economic Education will convene over 500 K-12 educators, industry thought leaders, and local affiliate, Federal Reserve and other partners from across the country for the 53rd Annual Financial and Economic Literacy Conference in Dallas, Texas. With networking events and over 100 hands-on training sessions, teachers can attest to the conference’s invaluable benefits: 96% of 2013 attendees reported that they are still using information or resources they gained at the conference; and 100% of attendees would recommend CEE’s Annual Conference to a colleague. And what’s more, by attending, teachers will earn certificates of completion that may be applied toward CEU requirements. Additionally, special roundtable sessions led by master teachers offer an opportunity to share best practices at the elementary, middle and high school levels. This year’s distinguished guest speakers include Richard W. Fisher (invited), President and Chief Executive Officer, Federal Reserve Bank of Dallas; Sharon Epperson, CNBC Senior Energy and Personal Finance Correspondent and frequent contributor to Today and NBC Nightly News; and Professor Alan B. Krueger, Bendheim Professor of Economics and Public Affairs at Princeton University. 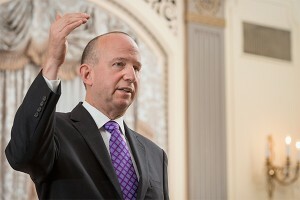 Professor Krueger served as Chairman of President Barack Obama’s Council of Economic Advisers and a Member of his Cabinet from November 2011 to August 2013. 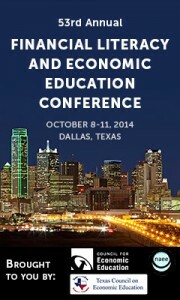 The 53rd Annual Financial and Economic Literacy Conference will be held October 8 – 11 at the Renaissance Dallas Hotel in Dallas, Texas. The Council for Economic Education is the leading organization in the United States that focuses on the economic and financial education of students from kindergarten through high school – and we have been doing so for 65 years. We carry out our mission by educating the educators: providing the curriculum tools, the pedagogical support, and the community of peers that instruct, inspire, and guide. All resources and programs are developed by educators, and delivered by our national network of affiliates. Our goal is to reach and teach every child. 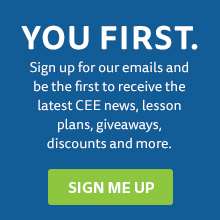 Each year CEE’s programs reach more than 55,000 K-12 teachers and over 5 million students across the United States. For further information about the Council for Economic Education go to: http://dev-council-econed.pantheonsite.io. In an effort to bring attention to the continued need for personal finance education in K-12 programming, over 80 industry, government and education leaders gathered on May 5 to discuss the state of economic and personal finance education in Delaware and how they are working together to improve the economic and financial literacy of young people. The program, held earlier this month at the Hotel du Pont, was the first of four regional events hosted by the national Council for Economic Education (CEE) and its local affiliate, the Delaware Council on Economic Education (DCEE), and sponsored by Capital One. Highlighted during the event was the progress already being made through the strong partnership forged with the University of Delaware’s Center for Economic Education and Entrepreneurship (CEEE).